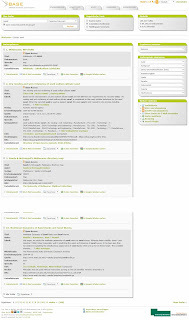 BASE (Bielefeld Academic Search Engine) is a multidisciplinary, scientific search engine. It was developed by the University of Bielefeld and the company FAST as part of a strategic partnership and launched in 2004. BASE is aimed in particular at students and scientists at universities and research institutions. BASE comprises contents of scientific document servers that are made available free of charge via OAI-PMH (Open Archives Initiative Protocol for Metadata Harvesting) as part of the Open Access movement. It aims to provide professionally qualified information in conjunction with extensive and high-quality metadata, thus distinguishing itself from commercial search engines. The search engine, concentrates primarily on Open Access publications, but also records audio, videos and maps, Research data, software etc. Metadata of selected OAI document servers are integrated via the Open Archives Initiative Protocol for Metadata Harvesting (OAI-PMH). In special cases, content from scientific websites is collected by an own web crawler. The full-text data determined here are analyzed for metadata contained. Wikipedia: »BASE (Bielefeld Academic Search Engine) is a multi-disciplinary search engine to scholarly internet resources, created by Bielefeld University Library in Bielefeld, Germany. It is based on free and open-source software such as Apache Solr and VuFind. It harvests OAI metadata from institutional repositories and other academic digital libraries that implement the Open Archives Initiative Protocol for Metadata Harvesting (OAI-PMH), and then normalizes and indexes the data for searching. In addition to OAI metadata, the library indexes selected web sites and local data collections, all of which can be searched via a single search interface. BASE is short for Bielefeld Academic Search Engine.